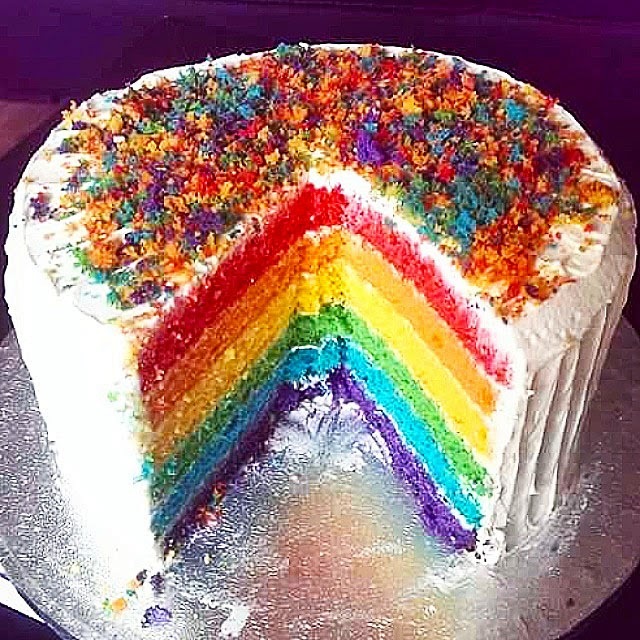 I made this particular rainbow cake for my dad's friend's daughter's birthday. She specifically requested I decorate the top with rainbow cake crumbs. At first I wasn't sure if it would look okay, and asked if she'd prefer rainbow sprinkles. Nope, she was adamant that it had to be rainbow cake crumbs. In the end I think it turned out pretty well (my dad's friend kindly sent me this pic of the cut cake). In other news, I'm going to be doing my sugar-free month next month (June)! I have so many events coming up where I'd usually eat sweet things and so there isn't an easy month to do it in, so I just picked June. The biggest kicker is that it's Tashcakes! 's and Wacky World of a Weird Girl's third blog birthday in June, too. I'll be making a cake... but I won't be eating it. My friends and family will be happy though!